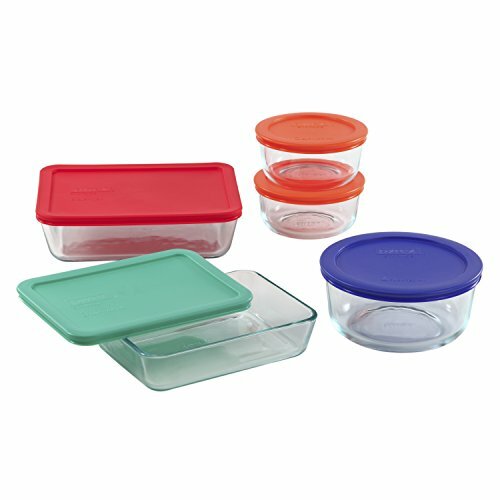 The Pyrex Simply Store 10-Piece Glass Food Container Set includes a 4-cup round dish with blue plastic lids, a 3-cup rectangular dish with green lid, a 6-cup rectangular dish with red lid, and two 2-cup round dishes with orange lids. Pyrex glass is dishwasher, refrigerator, microwave, pre-heated oven, and freezer safe; lids are BPA-free and top-rack dishwasher and microwave safe. These dishes come with secure-fitting lids to keep food fresher longer. Pyrex glass is non-porous, so it won’t absorb food odors, flavors, or stains. You can choose from various shapes and sizes, depending on your food storage needs, and they are easily stackable to save kitchen space. Made in the USA and comes with a 2-year limited warranty on the Pyrex glass and plastic lids against manufacturer defect. Pyrex Simply Store 10-Piece Glass Food Container set includes a 4-cup round dish with blue plastic lids, a 3-cup rectangular dish with green lid, a 6-cup rectangular dish with red lid, and two 2-cup round dishes with orange lids. Airtight, secure-fitting lids to keep food fresher longer. Pyrex glass is non-porous, so it won't absorb food odors, flavors, or stains. You can choose from various shapes and sizes, depending on your food storage needs, and they are easily stackable to save kitchen space.